Shared services have indeed transformed the way our organisations work today. It is a concept that has risen to incredible prominence over the last few years. These services simplify and standardise common transactional and knowledge-based processes across our organisations. They also have immense potential in enhancing operational efficiency by centralising many back-office functionalities. However, shared services are in a state of constant flux; hence they are looking for options to consolidate their strength in delivering consistent support across all functions of our organisations. Now let’s cut here to pan and zoom across to another emerging area – robotic process automation (RPA). RPA is often seen as the darling technology of every other vertical today. RPA’s ability to rein in inconsistency, structure data, and deliver repeatable efficiency while performing specific tasks has caught the imagination of shared services. RPAs have definitely built a strong case for organisations to build operational efficiency, reduce cost, and increase efficiency. But what’s the connection between shared services and RPA? Most of the shared services are transactional and administrative in nature. RPAs deliver their best expertise in simplifying and standardising these activities. Shared services include simple, repetitive, and routine operations that are common to most teams. RPAs simply adore repetitive tasks that are considered mundane by many people. Shared services witness a high volume of transactions on a regular basis. RPAs do not fear volume as long as they are repetitive and simple in nature. Each of these services present high scope for standardisation and automation. RPAs thrive in a standardised atmosphere. 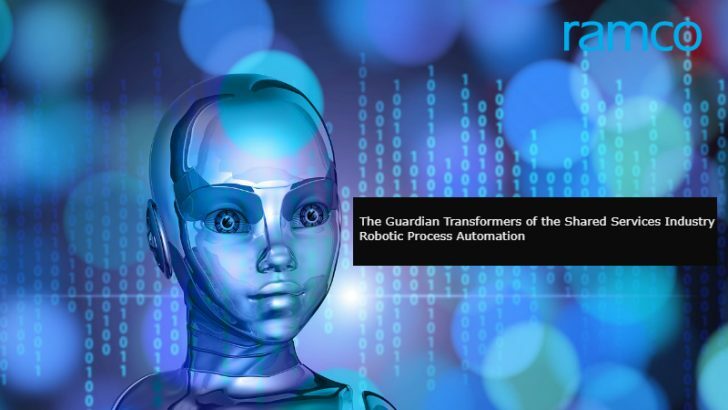 Looks like we’ve found the Transformer for the shared services industry – the ever-trustworthy RPA! Yes, many players of this industry have just scratched the surface of the immense potential of RPAs. So, why not dive a little deeper into RPA and find out how this technology can be leveraged to deliver on its best potential? RPA is not a new concept – but its rehashed version is fast gaining popularity. It has the potential to takeover some of the routine activities performed by people. RPA’s capability in studying rule-based tasks, adopting patterns, memorising them, and performing activities intelligently makes this technology a preferred candidate for shared services. RPA also has the ability to interact seamlessly with multiple systems in the backend of the organisation. It can gather data across different systems, integrate them, analyse the collated data, and deliver smart insights to the user. These insights are delivered across a simple, secure, and friendly conversational interface across geographies and in near real time. RPA is thus not just about automation – it’s about intelligent automation. It’s the difference between achieving a stable and automated environment versus benefiting from a cognitive and artificial intelligence–enabled support system. So, it’s no wonder that this value-added approach effectively reduces scope for error, improves overall productivity, and decreases the time taken to resolve routine yet quick turnaround activities in shared services. Most organisations are now taking the shared services route to centralise support services. This approach adds value by eliminating resource wastage and redundancy. In this scenario, RPAs have slowly yet steadily risen in prominence as a star solution that’ll meet all the expectations from shared services as a critical activity. Regular interactions with IT teams such as password resetting, routine maintenance, and data analytics. People-facing activities in HR such as leave application, on-boarding, and satisfaction surveys. Customer-facing activities that seamlessly enable customer interaction during customer on-boarding and first-level customer service support. F&A tasks such as basic accounting transactions, routine transactions, and payroll enquiries. The list is long and encouraging, especially given the impressive advantages RPA delivers to shared services in terms of increased productivity, task accuracy, clear communication, simple user interface, fast turnaround, and a scalable business model. The intersection of RPA and the shared services industry has just exposed the tip of the iceberg of opportunities. The cognitive and smart advantages that RPA delivers when combined with the lean model that shared services deliver can drive intense cost efficiencies, minimise scope for error, and improve business performance. This symbiotic support system can also free up human resources to perform higher-level activities that require more intellectual intervention. This scalable model of business definitely opens up scope for adding many more complex processes to the shared services industry. Sounds exciting, right? We know that you are keen to explore this interesting combination of RPA and the shared services industry. Do join our webinar on robotic process automation held in partnership with Schneider Electric, Hackett Group Consulting, and the Global Payroll Association to understand RPA in the context of the shared services industry. Ramco is a fast growing enterprise software player disrupting the market with its multi-tenanted cloud and mobile-based enterprise software in the area of HCM and Global Payroll, ERP and M&E MRO for Aviation. Ramco Systems focuses on Innovation and Culture to differentiate itself in the marketplace. Rohit Mathur is Vice President and Head of HCM/Payroll at Ramco responsible for managing the end-to-end business operations from product research and development (R&D), pre-sales, marketing and implementation, to support. With a strong educational background that manifested as BE (Electronics) and MBA degrees, Rohit set out to find his passion by journeying with various companies such as Capgemini, Mahindra System, Deloitte and Honeywell where he held roles in Sales, Business Consulting and Program Management.